What’s this #ILCSupporters tag I keep seeing throughout my social media?! #ILCSupporters is a grassroots campaign to increase the profile of the ILC throughout Japan and the rest of the world by getting lots of people to tweet/post/‘gram about the project. 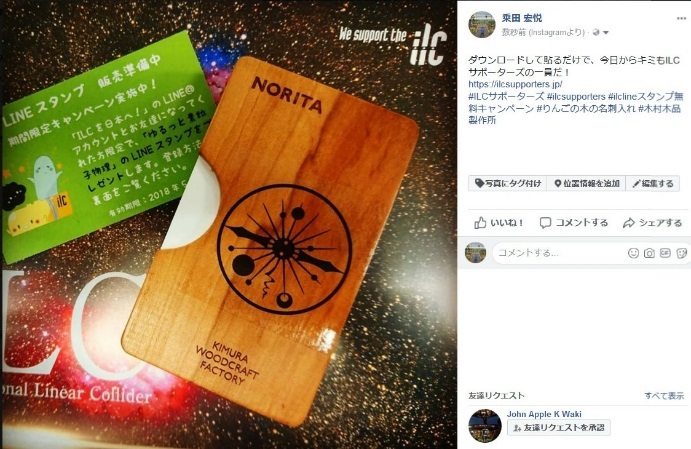 The brainchild of world-famous director Mamoru Oshii (Ghost in the Shell, Patlabor), the ILC Supporters just stands for any person who supports the ILC and hopes for it to be built in Japan. There are of course some high-profile members include screenwriters, manga artists, and anime producers, but the bulk of the #ILCSupporters are people like you and me – normal people who just really hope the ILC gets built in Japan! Every little bit counts. Building general support for the ILC is crucial, as the Japanese national government is being called on to a decision on the ILC project by the end of the 2018. Showing them that a whole lot of people really want the ILC built in Japan could be the tipping point to get them to give the green light. Anyone can become an ILC Supporter. If you support the ILC, consider taking this small step to help bring the dream to reality. *Remember to stick on a hashtag (#ILCSupporters or #ILCサポーターズ) ! If you make your post public, you just might get posted on this page. Our reporter Koetsu Norita placed a sticker on his cool business card case!